Last month I asked my husband to tell me something about a meat cleaver that is a family heirloom we have on display in our curio cabinet. Let me provide you with a bit about the original owner of the meat cleaver. George ‘Clark’ Bauman was born October 2, 1899 in Pritchett, Upshur Co, Texas to George Washington Bauman and Elizabeth Pamela Read. He was one of their 12 children. According to family stories Clark was in school in Dallas and apparently was a wiz in math. He must have gotten bored with the school because he quit and went to work for the railroad. Clark’s oldest brother, James “Horace”, was a self employed grocery merchant in 1917 in Estelline, Hall Co, Texas and by 1920 he was in Montaque Co, Texas. Sometime before 1924 Horace contacted Clark and asked him to bring his money ($500) and put it into the first cash grocery store in Anadarko. That is how their grocery partnership began. 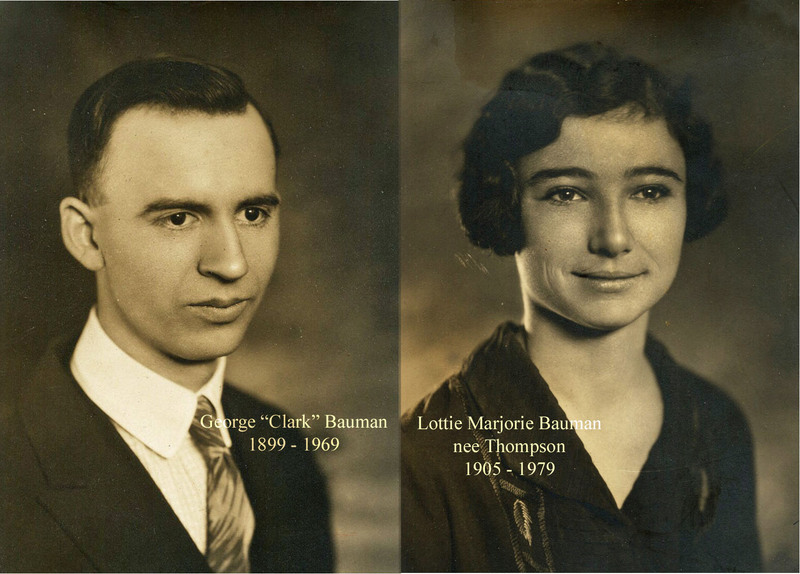 Once Clark was in Oklahoma he must have met Lottie Thompson and they were married on September 24, 1924 in Oklahoma. They lived in Anadarko, Caddo Co, Oklahoma, which is where their 3 sons and 1 daughter were born and raised. BAUMAN’S TO OPEN MEAT MARKET COMING WEEK J.H. BAUMAN of the firm of Bauman’s Grocery, informed us this morning that they had perfected plans for the opening of a meat market in the west room of their present store building, possibly the latter part of the coming week. They will handle fresh and cured meats and with this addition will be enabled to better service their customers. Fixtures have been ordered and will be placed in position as soon as they arrive. Sometime after 1930, Horace moved to Denton, Texas and continued the grocery business until his death in 1947. Clark remained as a grocer in the same buildings. Then around 1936 or 1937 Clark, who leased two buildings that were side by side, sold his grocery stock and leased his fixtures to a local grocer in the east side building while he opened a feed store and later a Western Auto store in the west building. By the spring of 1940 Clark sold the Western Auto store and the family moved to Olney, Oklahoma where Clark bought stock in a grocery store which he operated until the Spring of 1942 and the family returned to Anadarko. Clark again leased the same 2 buildings and operated a grocery store through the second world war and part of the Korean war (1942 – 1951). In the year 2002 (approx) my father, Donald Clark Bauman, gave to me the heavy meat cleaver that he and his father, George Clark Bauman, had used in Clark’s grocery business. Back then the grocery store owners would buy sides of meat and would butcher out the meat as their customers wanted. This meat cleaver is a relic of that time. The cleaver itself was made by Village Blacksmith. Stamped on the side is “Lexington 208″, which may be a model designation. The blade itself is 8″ x 4” by 3/16 inch thick. The handle is 6 ¼ x 1 ½ oval with some shaping of the tang to fit the hand. The handle is a full tang style with two pieces of hardwood secured with three through rivets. There is a hole through the blade on the corner across from the handle so the knife can be hung in storage. The back of the knife shows evidence of having been hammered on with a mallet or the back of another heavy knife. I guess this was to cut through some bone if the cleaver was hung up. Doing some research on the brand it seems that before 1940 the company name and model were inscribed into the blade as this one is. After 1940 the name went on the handle. Dad told me that meat cleavers were no longer allowed in the butcher process as it was easy to cut a shard of bone loose and have it stay in the meat. That does not happen when the bones are sawed. We were driving down the road one day and there was this wagon a man, woman and a team of horses with a cow tied in back. Daddy pulled up beside in the old ’35 pickup truck, went up and talked to him a little bit. Came back, untied the cow from the wagon, tied him up to the back of the truck and slowly drove home, put him in our back yard. 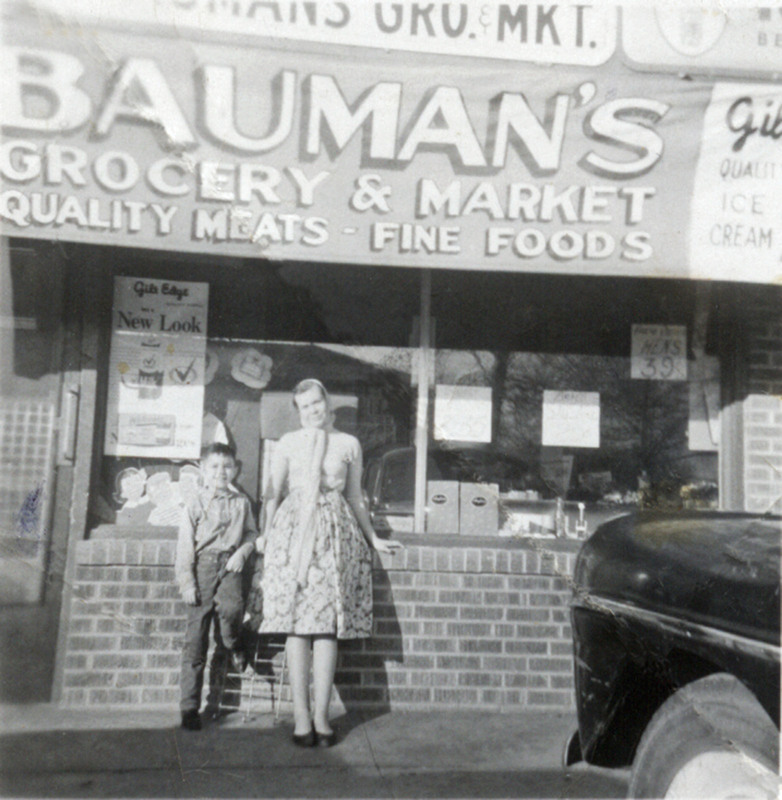 Bauman’s Grocery was a family business so Clark’s children worked in the store as soon as they were able. During the 30’s or 40’s customers would bring eggs in exchange for groceries and my father-in-law, Don, had the responsibility to candle the eggs to make sure there were no embryos before selling them. Using this meat cleaver, Don got pretty good at cutting sides of beef into roasts and such. They kept a side of beef hanging in the walk-in and if a customer wanted a larger portion than they had on display, they would go cut it off the side. Clark got out of the grocery business in 1951 because there was talk of rationing and price control and he did not want to put up with that again. After he sold all his fixtures and got out of the grocery business, he worked as a parts man for Clark’s Plymouth in Anadarko, which he did until his death on April 9, 1969. 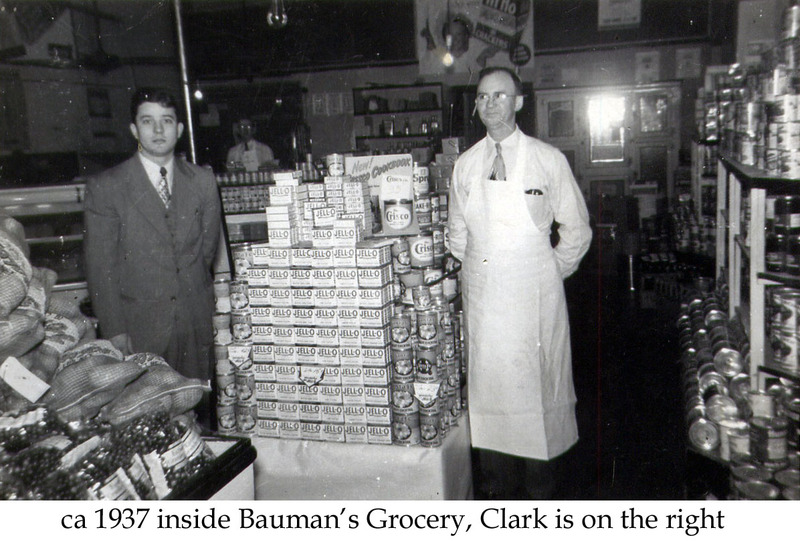 In keeping with the family tradition, James, Clark’s son, opened and operated for a time a Bauman’s Grocery in the early 1950’s in Chickasha, Oklahoma. GREAT SITE. IS JAMES BAUMAN THAT HAD THE GROCERY IN CHICKASHA THE SAME MAN WHO OWNED BAUMAN BUICK IN CHICKASHA ON MAIN STREET? I CURRENTLY OWN THE BUIDLING WHERE THE DEALERSHIP WAS AND WOULD LOVE PICTURES OR OTHER INFO. Hey Madison! We met several years ago at a Bauman reunion. I have a cleaver really close to the one described here but only says lexington village blacksmith. Just trying to look it up. Info on this would be greatly appreciated. Lesley, I wish I could help you but we don’t know any more than what I shared in this post. I know. It’s those little tidbits of info that can be so fascinating.